So, you’ve decided to venture beyond foosball and add an air hockey table to your home game room. Awesome choice! Whether it’s for entertainment or casual competitive fun, any player is sure to love this game. 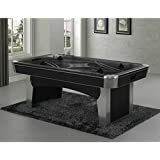 However, buying the right air hockey table can be time-consuming and overwhelming given that they come in several variations, sizes, designs as well as shades. If you are shopping for a new hockey table for your home, here are some guidelines that will help you make a well-informed decision on the best type of table that best suits your needs. These are the best representation of a perfect air hockey table. They are made of premium materials which makes them the most expensive in the market. Arcade-style air hockey tables are normally sturdier measuring 8 feet in length which is the full regulation size. This kind of table usually comes with a robust blower motor alongside other electronic extras such electronic scoring board, music and sound effects. The blowing motor allows for a smooth puck glide while the strongly constructed rink walls help with excellent deflection. These tables also feature a smooth playing surface for the best air hockey experience. The arcade-style tables are incredibly durable, providing you with an extensive amount of quality playing times. This makes them an excellent choice for those homeowners who want to get the most out of their table for years to come. such as electronic scoring panel, music, and flashlights. These tables are available in various sizes ranging from mini tables to full-size tables with the latter being more expensive. They are more suitable for children and teenagers but not so much for an avid adult who is looking for a better playing experience. Tabletop air hockey tables are a perfect solution for those who don’t have enough space available for a permanent full-size table. This version is portable and very easy to store. It features rubber feet making it easy to place on any tabletop. For instance, it can be used on your dining room table, game room table as well as the floor surface. 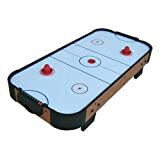 This kind of table is a perfect choice for people who are looking for the most economical way to play hockey in their house. It is also perfect for small kids since it can be placed at any height. 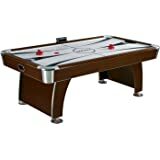 A multi-game table is designed to allow you to play several different games on one table including air hockey. 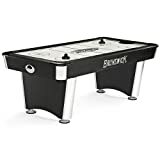 For instance, a multi-game table may be equipped to incorporate table tennis, foosball, bowling along with board games like checkers and chess. This kind of table is a good option for people looking for a diversity of games in one unit. However, the diversity experience may affect the quality of the air hockey game experience. The different types of tables available in the market are supposed to suit different skill levels. That’s why it is important to know your skill level before you make a purchase. Tables of different designs depending on the player’s level of experience will vary in price. 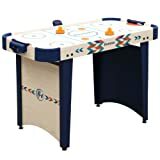 Beginner: If you are a beginner or if you are buying an air hockey table for a child, it would not be advisable to purchase an expensive table. 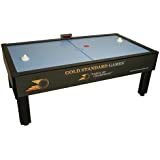 You should not spend more than $100 on a table that will only be used occasionally by a learner who only possesses basic air hockey skills and is looking to develop them. It is, however, important to note that these low-cost air hockey tables are less hard-wearing and they are likely to lose stability and get distorted over a short period. Intermediate: a table that is suitable for intermediate players are made of good quality materials which makes them more expensive. They are strongly-constructed and larger than the beginner tables and provides a better playability. A table in this category will measure 7 feet in length. There are larger options available with fewer features or smaller ones with more features depending on your budget. These tables have a more durable playing surface which does not scratch or dent easily. This table is perfect for those who want to advance their skill level. 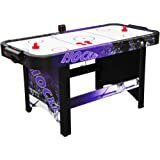 Advanced: if buying an air hockey table for advanced players, then you should get an arcade-style or top-quality, full-size professional air hockey table. These two options are sturdy and durable. These long-lasting tables have an extremely flat and extra smooth playing surface as well as thick rink walls designed for accurate deflection. Although the initial cost will be high, these premium tables will be a great investment that will give you a great deal of use for years to come. When shopping for an air hockey table, there are some important elements you should look at to determine if it is constructed to accommodate your style, skills, and intensity of play. Air hockey tables come in different sizes, and they contain various components such as the exterior, walls, and motor. The quality of the components is something you should consider before making a purchase. Here are other features that you should look out for when purchasing a new air hockey table to ensure that you get the best value for your money. The size of the table is one of the most important features that you need to pay attention to. You should consider the amount of space you have and whether it is enough to accommodate the type of table you intend to buy. Also, you need to take into account the extra space needed for players to stand at each end of the table to hit the puck. Air hockey tables are available in various sizes ranging from 2 feet (24″) to 8 feet (96″). You’ll need an open space area of at least a 10-feet by 7-feet if you want to fit a full-size air hockey table. Smaller air hockey tables, on the other hand, requires less space. They are suitable for those don’t have sufficient space and for use by younger children. They are normally portable and can be used anywhere. It is important to note that the larger the table size, the more expensive it will be. Tables of 2 feet or 24 inches: This is the normal size for tabletop tables. These tables are great if you have limited space as they can be easily folded and stored away after use. They are a perfect choice for small children. 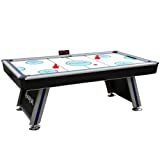 Tables between 4 to 6 feet or 48 to 72 inches: This is the average size for air hockey tables, and most indoor hockey tables fall into this category. They offer an excellent choice for a majority of purposes. 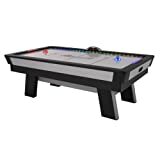 Tables between 7 to 8 feet or 84 to 96 inches: This is the standard size of a tournament grade air hockey table that delivers the highest-quality playing experience. The arcade-style air hockey tables come with this size. Tables that fit into this segment are usually the most the expensive. In most cases, the tabletop or small free-standing tables are manufactured from plastic and board materials. However, high-quality tables should be more compact and should be made from a combination of solid wood and metal. Professional tables are built this way to allow them to handle the weight of the table top in addition to players leaning on it during a game. The better-built tables tend to be more expensive. Ideally, a good table should have a high output and approved motor to be able to pump air and to evenly distribute it across the playing surface. This air allows the puck to glide better for a great air hockey game experience. A superior motor should run quietly and constantly for a considerably longer period without overheating. Some tables will feature levelers attached to the base of each leg. This allows for proper leveling even when playing on a surface that is not perfectly flat or level to allow you to play on an even surface. Look for rink walls that are made of thick nylon or solid aluminum for excellent deflection, and lively rebound of the puck as well as durability. They are also less likely to dent or scratch over time. More economical tables for occasional use are available with laminate aluminum rink walls, but they are less durable with weak rebound and inaccurate puck deflection. Though expensive, a table with solid side walls is a good quality air hockey table. Air hockey tables are either electric or battery powered. Smaller models and tabletops come with batteries and an adapter which allows you to play anywhere even outdoors. Larger models on the other hand only use plug-in systems. A table with a combination of both the battery system and a plug-in system is a good choice if you like playing outside where there no electrical outlets. However, batteries tend to run out fast and require regular replacement which can be expensive. Look for a thicker table of about 3/4″ for a quality extra smooth playing surface. Thicker tables usually deliver excellent playability. 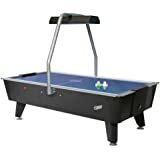 Buying the right air hockey table is the first step towards enjoying endless fun air hockey moments with your family. The process of determining the right table should be guided by your level of skill, your budget and the space available in your home as well as the quality of the table. When all’s said and done, your purchase decision should come down to finding the best table that suits your needs. How much room will I need for a 6’ air hockey table? I’ve searched the web but can’t find the answer. You’ll probably want a room that gives you at least a 10-foot by 7-foot area of open space to allow for comfortable game play.